We’d love your help. Let us know what’s wrong with this preview of Smite Me, Oh Dark One by Steve Thomas. Acerbus hates his job. While he is content to watch and study the mortal races, the other gods constantly look for reasons to destroy their newly-created world. When they finally find an excuse, they command Acerbus to become the Smiter, destroyer of all creation. Armed with nothing but spite and goblins, Acerbus decides that there is only one way to ensure his own failure Acerbus hates his job. While he is content to watch and study the mortal races, the other gods constantly look for reasons to destroy their newly-created world. When they finally find an excuse, they command Acerbus to become the Smiter, destroyer of all creation. Armed with nothing but spite and goblins, Acerbus decides that there is only one way to ensure his own failure and save the world: by becoming an Evil Overlord. 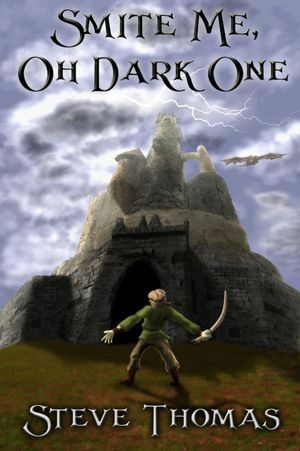 “Smite Me, Oh Dark One” is a comedic fantasy short story. To ask other readers questions about Smite Me, Oh Dark One, please sign up. Will definitely be looking for more by this author. 4.5, rounding up. Clever, witty, oddly poignant. Great short story! He saw it as a parody of Lord of the Rings, specifically the more Silmarillion bits. Me, being unfamiliar with those nuances of Tolkien's world, read it as a more general sort of fable along the lines of the bad guy not really being evil, but misunderstood, and also how people often prefer comforting lies to hard truths and like to go along with things without necessarily thinking them through. We agree that it works on both levels. Tolkien's mythos is sort of cribbed from some of the world's own, afterall. As such - I wholeheartedly support this story on multiple levels. And the fact that it was done with humor and style in a quickly paced story is just a double win. "Smite Me, Oh Dark One" by Steve Thomas is a short story about the stupidity of gods. Or the stupidity of humans. Or, well, something like that. The narrator of the story is Acerbus, the God of Darkness. He seems to be the only power with any common sense at all. Lux, the God of Light, leads the other gods to perform some fairly inane actions, while Acerbus stands there wondering how he ended up in this particular funny farm. In the end, Acerbus gets his own bit of revenge. I love the humor in th "Smite Me, Oh Dark One" by Steve Thomas is a short story about the stupidity of gods. Or the stupidity of humans. Or, well, something like that. Fantastic short story. I don't normally read many short stories, but I found this one free on amazon and decided to read it last night. it was extremely fascinating tale of how the world was created by a group of gods who each have their own idea on how to create the world. Strangely, the only one who got it right was the god of darkness and destruction. when he is chosen to destroy the world, he comes up with a brilliant loophole to make the world the way it is today. This was the funniest thing I've read in ages. Anyone who ever wondered just why the Dark Lord ended up in a tower with orcs (and whether his motives are quite as black as they're painted), this book might give you some hints. And it will put a smile on your face - guaranteed! A great short story that doesn't take itself too seriously. Definitely contains some commentary, delivered via humour. I highly recommend. Smite Me, Oh Dark One is a very quick, hilarious read. When the God of Darkness doesn't want to be the one to destroy the world what happens? He becomes an Evil Overlord with a legion of goblin defenders of course! The story Steve has written was original and amusing and I truly hope to see more work of this nature from him. It's free! Give it a read and enjoy. Fantastic! A great, sarcastic short story. See my review for this with my review of Klondaeg The Monster Hunter.